Firebox is lined with refractory brick lining, custom molded. There is a front loading, as well as an 11" inch lid on top to put fuel in. 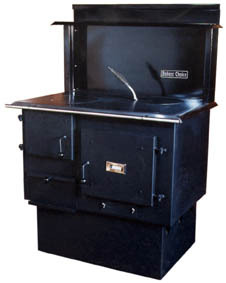 The Baker's Choice has grates, equipped to burn either wood or coal. Hot water coil - warm oven & water tank options available. The intensity of the heat is controlled by how much air goes into your firebox though the grates. Air goes into your fire chamber when the ash pan is pulled out. The Bakers' Choice has some stainless steel to protect against corrosion. The stove is painted black with high heat paint, it's not porcelain enamel. One size only, with a water reservoir. The oven door swings out, not down. There is a lid for the water reservoir. Note: Unlike most stoves, even though they are tested to UL standards, they need floor protection ¾" thick that extends to the front and sides an additional 18"
Approximate. Area Heated 2,000 sq. ft. If you want nostalgic design, world class appearance or a nice finish, this is not your stove. Bakers Choice ranges are built for function, not form. They are assembled in a farmer's backyard. Like most things on a farm, how it works means much more than how it looks. Customers who buy this stove are usually happy with its performance but often complain about nonaligned seams and rough finishes that may show weld spatter.